Wow. This week's number one son: Timothy DeLaGhetto. 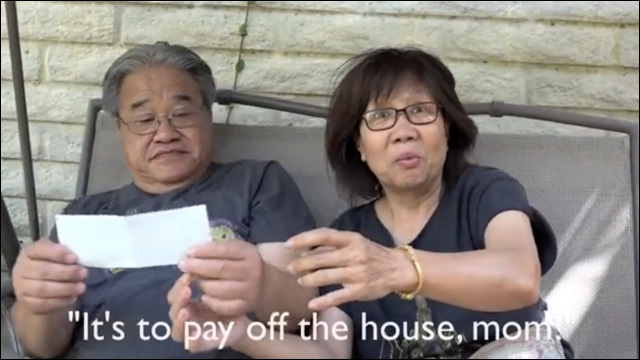 On Monday, the YouTube star posted a video in which he presented his parents with a check of $210,000 to pay off their mortgage. Tim, a rapper and comedian whose YouTube channel has more than 2.4 million subscribers, dropped out of college five years ago to pursue a career in entertainment. This probably wasn't Mr. and Mrs. Chantarangsu's preferred plan for their son, but he reassured them that he would make it big and pay off the house. Tim's parents own a Thai restaurant. And by the way, they're hilarious. After receiving the check, it's all hugs and smiles and tears, and his dad asks, "What about grandchildren?" It's always something, right? "Either grandchildren or a Mercedes." Better get back to work, Tim.